(Nanowerk Spotlight) Integrating biological molecules or even complex molecular machines with man-made nanoelectronic devices is one of the ultimate goals of bionanotechnology. Already there is a growing community of researchers interested in this area of bio/nano integration where biological components – proteins, protein complexes, nucleic acids, etc. – are interfaced with inorganic nanomaterials to create new devices and systems that combine the desirable properties of each system. One particular nanomaterial used in this kind of research are carbon nanotubes (CNTs). They are particularly promising candidates for building an inorganic platform for electronic integration of biomolecules given their ability to operate in physiological conditions, high sensitivity, and size scale suitable for working with individual proteins. 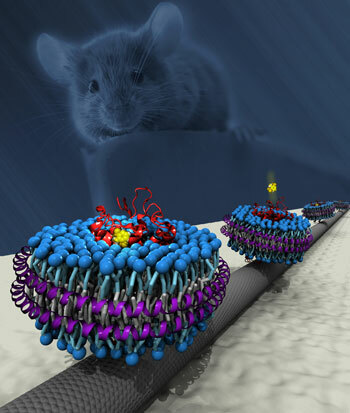 "While significant progress has been made along this path using soluble proteins and nucleic acids, integration of amphiphilic membrane proteins remains in an early state of development despite their vital and varied functionality in living organisms," Charlie Johnson, professor in the Department of Physics and Astronomy at the University of Pennsylvania, explains to Nanowerk. These proteins play a vital role in living organisms. One large family of these receptors, G-protein coupled receptors (GPCRs), involved in many diseases and GPCRs are important targets for modern drug agents. What Johnson and his group of collaborators (from the universities of Pennsylvania, Miami, and Illinois, as well as Princeton University, Monell Chemical Senses Center, Evolved Machines and Nanosense) have done is the integration of a CNT transistor with olfactory receptor proteins (ORs – the most numerous class of GPCRs). The ultimate goal of this type of research is to transfer the sensing properties of biological molecular systems to artificial electronic devices. With regard to olfactory sensing properties, this could for instance mean that with 'electronic noses' – an electronic system that can smell – there would no longer be a need to use animals to perform tasks that rely on a highly sensitive sense of smell – e.g., drug or bomb detection or potentially disease diagnosis. Reporting their findings in the June 22, 2011 online issue of ACS Nano ("Biomimetic Chemical Sensors Using Nanoelectronic Readout of Olfactory Receptor Proteins"), the scientists describe how they successfully developed purification, solubilization, and biofunctionalization schemes that enable control of the bionano interface between ORs and carbon nanotubes. Integration of membrane proteins, like ORs, is particularly challenging because their amphiphilic nature makes them difficult to express, purify, and solubilize. The success of Johnson's team with ORs should drive further research into nano-bio integration of other membrane proteins and GPCRs. To fabricate their sensor, the researchers first purified ORs from cells and then solubilized them in two distinct nanoscale constructs: digitonin micelles and engineered, stable, self-assembling nanoscale membrane assemblies known as 'nanodiscs'. They then attached these solubilized ORs via a polyhistidine tag (Histag) to high-quality nanotube transistors that were previously functionalized with nickel-nitrilotriacetic acid. "After integration with nanotube transistors, the ORs retain their biological functionality for odorant binding, while binding events are read out electronically by the nanotube transistors," says Johnson. "Our OR-nanotube hybrids show responses to vapor analytes that agree with the responses of the ORs when they are expressed in a 'heterologous system', that is, a cell system (frog eggs, in our case) that is different from the organism that the ORs are derived from (we used mouse ORs)." Previous work on integration of membrane proteins was along two paths. ORs had been integrated with nanotube transistors and other systems (conducting polymers) either as a crude membrane fraction (i.e., ORs embedded in the membrane from the cell where they were expressed) or as ORs in a surfactant solution simply deposited onto the surface of nanotubes and polymer nanowires. "We were motivated to make bioelectronic hybrids where there is a carefully designed chemical linkage between the OR and the nanotube device, as well as an engineered membrane-like environment for the OR" says Johnson. "We believe that these more complex strategies for housing the OR and coupling it to the nanotube transistor are what enable us to demonstrate nanotube-OR hybrids with vapor responses that show strong agreement with the responses measured in another cell system. 1)	One key challenge is to purify the olfactory receptor protein from the cellular expression system while retaining the OR in its properly folded state. "We believe that our success in purifying the OR and then solubilizing it through the use of digitonin micelles and the nanodisc assembly is of particular interest. Ours is the first work with integration of ORs with a nanotransistor where the OR has been housed in an engineered membrane-like environment." 2)	The team have also taken a previously published nanotube functionalization approach based on carboxylated diazonium salts and for the first time demonstrated its application to nanotube transistors with high reliability and yield. They are now in the process of extending the technique to graphene devices. 3)	A final key finding is that when ORs are housed in nanodiscs, they have a lifetime of several months, almost two orders of magnitude longer than the day-long lifetimes that are typical for such a bioelectronic system. This is a significant step towards making practical bioelectronic devices with reasonable operational lifetimes. Johnson notes that a key outstanding challenge before moving toward an application would be to develop more rapid, reliable methods for the expression of ORs and other membrane proteins. "The biggest challenge that I see is in the expression of the ORs" he says. "Our team was able to express three ORs with considerable effort. The human olfactory system incorporates about 350 different ORs, while that of the dog has more than 1000. At the moment, generating such a large number of ORs is far beyond the state of the art. This work brought together scientists from numerous different fields, and there are important challenges to be addressed in all of them. "